U.S. 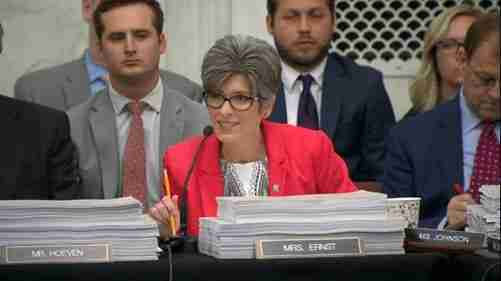 Senator Joni Ernst (R-IA) joined Senators David Perdue (R-GA), Angus King (I-ME) and 23 bipartisan members of the U.S. Senate Armed Services and Budget Committees in sending a letter to Acting Secretary of Defense Patrick Shanahan requesting his commitment to the timely completion of a full audit of the Department of Defense in FY2019. Senators Ernst, Perdue and King were joined by Senators Marsha Blackburn (R-TN), Richard Blumenthal (D-CT), Mike Braun (R-IN), Tom Cotton (R-AR), Kevin Cramer (R-ND), Mike Crapo (R-ID), Tammy Duckworth (D-IL), Mike Enzi (R-WY), Tim Kaine (D-VA), John Kennedy (R-LA), Ron Johnson (R-WI), Doug Jones (D-AL), Joe Manchin (D-WV), Gary Peters (D-MI), Mike Rounds (R-SD), Bernie Sanders (I-VT), Rick Scott (R-FL), Jeanne Shaheen (D-NH), Dan Sullivan (R-AK), Pat Toomey (R-PA), Chris Van Hollen (D-MD), Elizabeth Warren (D-MA) and Ron Wyden (D-OR).